Set Masers to "Fashion Disaster"
If you missed the Eighties, and wondered what fashion was like back then, I think the super-hero Maser would agree it all comes down to one word: Headbands. You are a kung-fu master, hopefully appearing in your own comic book. That's it, folks. And though my Maser mastery doesn't exactly top the charts, I'm pretty sure he doesn't qualify. The rest of the outfit is boilerplate vintage super-hero, from the Captain America gloves and boots to the vaguely Alpha-Flight style bifurcated color leotards popular in the era. Aside from the headband, though, the two bits that really bug me are the "lazy M" logo and the underarm cape rope. As to the first, having the two logos pointing in different directions makes me think he's got one of those spinning hubcap things going on, where the letters twirl crazily as he dashes about. As for the underarm cape thong, can you say "chafing"? Seriously, I hope he has some serious shares in an aloe vera factory, because dude will need it. Especially since, let's be honest, he probably shaves his body all over, so he can stay smooth and shiny when he finally, mercifully, sheds that outfit. I bet he perms that hair, too. On the other hand, down the road maybe he kept the costume but decided the "M" stood for "Metrosexual" instead, and he landed a bunch of lucrative endorsements. Which he'll need to treat the crippling case of "Burned Pit Syndrome" he's in for. 16 Responses to Set Masers to "Fashion Disaster"
Has anyone else noticed that he seems to have stolen Power Girl’s cape, boots, gloves and belt? He really only changed the cape and belt by adding that stupid M logo. I’m just happy he didn’t steal her leotard. Iknow there’s supposed to be suspension of disbelief in comics, but how the hell would that cape be funtional? Unless that rope is a bungee cord, That cape isn’t staying in place. And if it is, he’s got dead arm from the loss of circulation that has to be happening. @Patriot_Missile, so the cord is just there for aesthetics? That’s almost worse. We can only hope that if it is the button holding it on that it’s a giant tie tack and he has to hammer into his chest everytime he puts it on. which universe is Maser in? McKnight (1) I’m happy he didn’t steal her cleavage cutout. 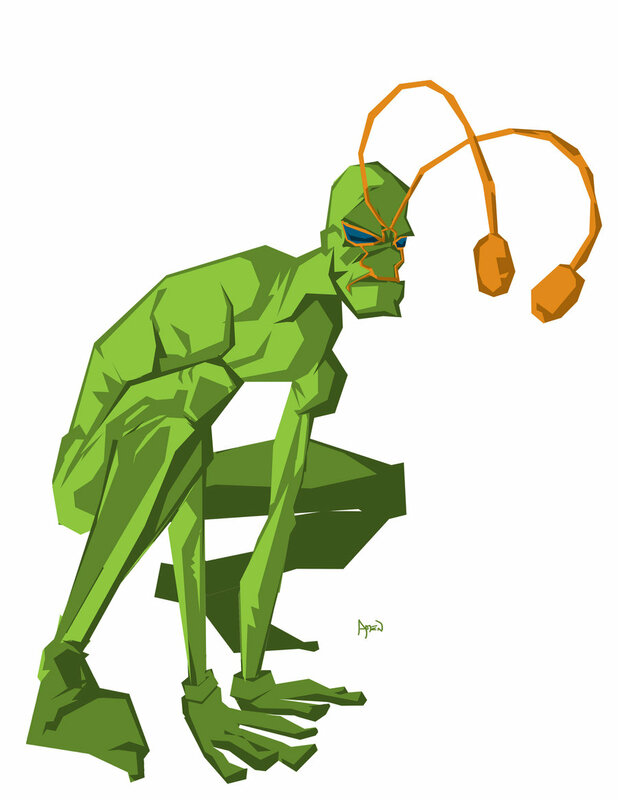 Also @ Jeff (a la Chris Crocker): Leave Ambush Bug alooooooone! Capes like that are occasionally used for military dress uniforms. But whoever decided they looked good on superheroes obviously forgot that “dress uniforms” aren’t the sort of thing you would ever intentionally wear to a fight. Myro (8): Wasn’t gonna go there. Didn’t want the visual. @McKnight57(10): Really? I didn’t resist doing this some time ago, but it fits the theme so nicely…. @ Frevoli : DC, if I recall correctly. 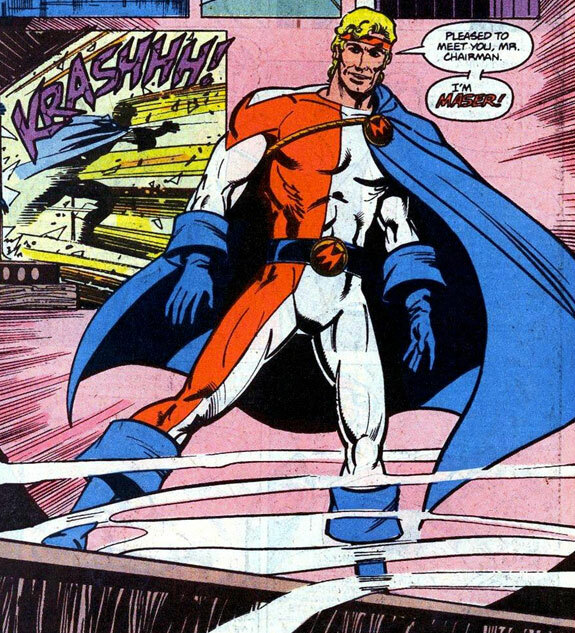 I don’t remember the costume, but I do remember the name, which was a step up from his original superhero name – Airwave II. His father was a WW2 superhero with a helmet that was basically a superadvanced radio scanner (for the time – we haveven smaller ones now) and he inherited the helmet but had extra abilities from it. Some writer took a look at the character, decided he needed a do-over, dusted him off and had him become a stooge of an evil corporation that discovered his powers were innate and helped him learn even more that he could do with them. No good can come from the blond haired, blue eyed, white guy calling himself ‘The Master’. Just say’in. Not Master, Big Mac. Maser. Microwave Amplification by Stimulated Emission of Radiation. Though I wouldn’t be surprised if people he introduces himself to make the same mistake you did–you don’t really hear a lot about masers, after all, outside of sci-fi and anime. Wow. I can’t believe I did that. Well folks, thats public schools for you. His arch-enemies call him The Maserbater, just to piss him off.